0.5oz bottle is FREE when you get a 2oz bottle! 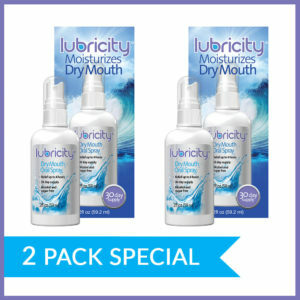 Lubricity Dry Mouth Spray’s intended use is to relieve symptoms of dry mouth in and around the oral cavity. Lubricity has a unique formulation that contains ONLY 5 ingredients and is alcohol, sugar & gluten free. Ingredients: Water, Xylitol, Sodium Hyaluronan, Sodium Benzoate, and Potassium Sorbate. © Lubricity Innovations, Inc. All Rights Reserved.